The Effective Annual Rate (EAR) is the interest rate that is adjusted for compoundingCompound Growth RateThe compound growth rate is a measure used specifically in business and investing contexts that determines the growth rate over multiple time periods. It is a measure of the constant growth of a data series. The biggest advantage of the compound growth rate is that the metric takes into consideration the compounding effect. over a given period. Simply put, the effective annual interest rate is the rate of interestInterest ExpenseInterest expense arises out of a company that finances through debt or capital leases. Interest is found in the income statement, but can also be calculated through the debt schedule. The schedule should outline all the major pieces of debt a company has on its balance sheet, and calculate interest by multiplying the that an investor can earn (or pay) in a year after taking into consideration compounding. The Effective Annual Interest Rate is also known as the effective interest rate, effective rate, or the annual equivalent rate. Compare it to the Annual Percentage Rate (APR)Annual Percentage Rate (APR)The Annual Percentage Rate (APR) is the yearly rate of interest that an individual must pay on a loan, or that they receive on a deposit account. APR is used on everything from mortgages and car loans to credit cards. Ultimately, APR is the simple percentage term used to express the numerical amount paid by an individual or entity yearly for the privilege of borrowing money. which is based on simple interestSimple InterestSimple interest formula, definition and example. Simple interest is a calculation of interest that doesn't take into account the effect of compounding. In many cases, interest compounds with each designated period of a loan, but in the case of simple interest, it does not.. The table below shows the difference in the effective annual rate when the compounding periods change. Table: CFI’s Free Fixed Income Fundamentals Course. For example, the EAR of a 1% Stated Interest Rate compounded quarterly is 1.0038%. The Effective Annual Interest Rate is an important tool that allows the evaluation of the true return on an investmentReturn on Equity (ROE)Return on Equity (ROE) is a measure of a company’s profitability that takes a company’s annual return (net income) divided by the value of its total shareholders' equity (i.e. 12%). ROE combines the income statement and the balance sheet as the net income or profit is compared to the shareholders’ equity. or true interest rate on a loan. In the case of compounding, the EAR is always higher than the stated annual interest rate. The change, in percentage, from the beginning balance ($10,000) to the ending balance ($11,268) is ($11,268 – $10,000)/$10,000 = .12683 or 12.683%, which is the effective annual interest rate. Even though the bank offered a 12% stated interest rate, your money grew by 12.683% due to monthly compounding. The effective annual interest rate allows you to determine the true return on investment (ROI)ROI Formula (Return on Investment)Return on investment (ROI formula) is a financial ratio used to calculate the benefit an investor will receive in relation to their investment cost. It is most commonly measured as net income divided by the original capital cost of the investment. The higher the ratio, the greater the benefit earned.. Enter your name and email in the form below and download the free template show above now! 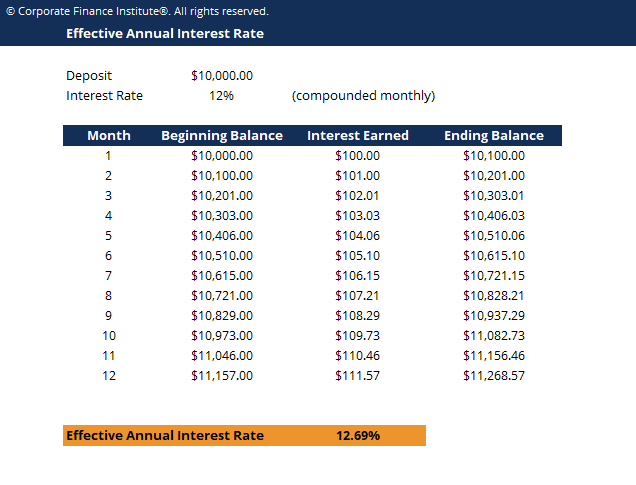 How to Calculate the Effective Interest Rate? The compounding periods are typically monthly or quarterly. The monthly compounding periods may be 12 (12 months in a year) and 4 for quarterly (4 quarters in a year). Therefore, EAR = (1+0.36/12)^12 – 1 = 0.4257 or 42.57%. Why Don’t Banks Use The Effective Annual Interest Rate? When banksList of Top Investment BanksList of the top 100 investment banks in the world sorted alphabetically. Top investment banks on the list are Goldman Sachs, Morgan Stanley, BAML, JP Morgan, Blackstone, Rothschild, Scotiabank, RBC, UBS, Wells Fargo, Deutsche Bank, Citi, Macquarie, HSBC, ICBC, Credit Suisse, Bank of America Merril Lynch are charging interest, the stated interest rate is used instead of the effective annual interest rate. This is done to make consumers believe that they are paying a lower interest rate. For example, for a loan at a stated interest rate of 30%, compounded monthly, the effective annual interest rate would be 34.48%. Banks will typically advertise the stated interest rate of 30% rather than the effective interest rate of 34.48%. When banks are paying interest on your deposit account, the effective annual rate is advertised to look more attractive than the stated interest rate. For example, for a deposit at a stated rate of 10% compounded monthly, the effective annual interest rate would be 10.47%. Banks will advertise the effective annual interest rate of 10.47% rather than the stated interest rate of 10%. Essentially, they show whichever rate appears more favorable.